International Release date is January 2016. Available in CD and Download formats at all online distributors including Amazon, ITunes, and CD Baby. "For those who think that big band music should capture a nostalgic spirit of the music of days gone by, The 14 Jazz Orchestra may not be what they are looking for. But for those who are uplifted by orchestral jazz as initially defined by Duke Ellington and continued over the years by visionaries like Charles Mingus, George Russell and Gil Evans, the Orchestra’s debut CD, Nothing Hard Is Ever Easy will be a joyful revelation. Comprised of some of the Miami area’s most accomplished jazz and studio musicians and jazz educators under the direction of the remarkable arranger/conductor Dan Bonsanti, The 14 Jazz Orchestra has been delighting audiences with its exciting and challenging contemporary jazz since its initial performance in October of 2013. With the release of Nothing Hard Is Ever Easy the entire world of jazz will become aware of this extraordinary ensemble. The album’s repertoire covers the full spectrum of the modern jazz era, spanning nearly 70 years. But with the brilliant arrangements of Bonsanti (who arranged all but one of the eleven pieces) the music is utterly contemporary and distinctly adventurous without ever losing its overall sense of lyricism and rhythmic drive. And although the styles embrace mainstream jazz classics, popular hits, gospel and fusion works – connected to such legendary figures as Miles Davis, Duke Ellington, Charlie Parker, Weather Report, Joe Henderson, Chick Corea and Ray Charles - there is a seamless continuity to the album, as each piece flows naturally in context to the next, creating a sonic portrait of unified expression. The musicianship is impeccable, with each musician owning the music, and making the large group swing with the ease and dexterity of a much smaller ensemble, feeding upon each other’s energy and participation with a fire and synergy that is simply exhilarating. All alumni of the prestigious University of Miami, the members are Ed Maina, Ed Calle, Neal Bonsanti and Peter Brewer on reeds; trumpeters Stephen Reid, Cisco Dimas and Ray Chicalo; Dante Luciani and Major Bailey on trombones; and a rhythm section of Jim Gasior on keyboards, guitarist Tom Lippincott, with Matt Bonelli and Jack Ciano on bass and drums. A trio of special guests (all UM attendees as well) bring their formidable talents to the album – bassists Will Lee and Mark Egan on one track each, and drummer Marko Marcinko on three. The one non-Bonsanti arrangement is by the great Clare Fischer with his impressive take on Billy Strayhorn’s U.M.M.G. (re-orchestrated by Bonsanti) that opens the album. A straightforward sojourn in swing, it features fine solos by altoist Maina, trombonist Luciani and Gasior on piano. From an even earlier era is Donna Lee (In Disguise) a very contemporary variation on the iconic be-bop classic. A hard-driving, take-no-prisoners scorcher, it’s fueled by Tyner-ish chordal piano and similarly clustered horn lines powering a fiery piano solo and blistering tenor by Calle, all stoked by Marcinko’s spirited drumming leading to a dynamic shout chorus climax by the horns. Marcinko also drives Don Grolnick’s Pools, a vividly syncopated, infectious and playful Caribbean-feel jaunt. Launched with a delightful tenor/bass unison line, it features terrific solos on tenor, guitar and steel-pan-emulating keyboard, all simmering over vibrant bass, spiced nicely by horns and building to a powerful climax. From outside the strict jazz tradition comes a bouncing, bluesy take on Paul McCartney’s With A Little Help From My Friends, built on the rock-solid bass foundation laid down by Will Lee. A darkly lustrous sound of muted brass and rich reeds gives the piece a totally new color and Calle’s gutty solo sings somewhere between Gene Ammons and Stanley Turrentine. Percy Mayfield’s Hit the Road, Jack forges a groove less belligerent than the Ray Charles classic, in a soulful medium blues drag, featuring growling trumpet by Cisco Dimas. A deep blue alto cadenza launches a powerfully soulful version of Rev. Tom Dorsey’s Take My Hand, Precious Lord, marked by prayer-meetin’ solos by trumpeter Ray Chicalo and the burly baritone sax of Peter Brewer. Giants of jazz modernism are represented by two beautiful waltzes, Chick Corea’s Windows and Joe Henderson’s Black Narcissus. The former is buoyant and smoothly swinging, with excellent solos by Calle and Luciani in a setting perfectly framed by the tasteful and silky groove laid down by bassist Mark Egan. The latter receives a richly textured and inventive arrangement that provides the ideal terrain for an appropriately virile tenor solo by Calle. Jaco Pastorius’ dedication to his children, John and Mary shifts back and forth between gorgeous balladry of filigreed delicacy and jaunty Caribbean-ish flair. Recorded for the first time since Jaco’s 1975 debut album, it’s sumptuously colored and captivating in mood, and features a splendid duet of Calle’s sinuous soprano sax and Ciano’s spirited drums. The spirit of Jaco is again invoked with the classic Weather Report piece, Wayne Shorter’s Palladium. Despite the big band format, the uniquely atmospheric essence of Weather Report is dynamically captured here, the horns blending perfectly with the rhythm section to do justice to that majestic and highly compelling sound. The album closes with John Scofield’s You’re Under Arrest from the Miles Davis album of the same name. Vividly syncopated, no-nonsense funkiness, with jagged, barking horn lines, cascading keyboards, crisp razor-sharp ensemble playing, and even a touch of that late-Miles style of trumpet percussion all blend together with pulsing bass and Marcinko’s sprightly back-beat drumming to close out this exceptional album on a jubilant note. Nothing Hard Is Ever Easy – containing nearly 80 minutes of sensational music – is a breathtaking and inspired foray that places this group in the forefront of modern orchestral jazz and should establish Dan Bonsanti as one of its most eminent arrangers and leaders." 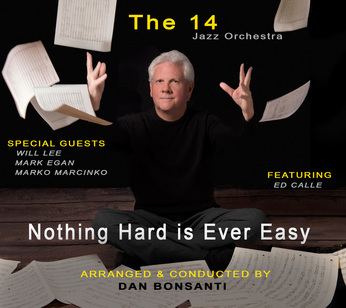 Under the direction of arranger/conductor and educatorDan Bonsanti, The 14 Jazz Orchestra delivers its debut recording with Nothing Hard Is Ever Easy presenting a repertoire of contemporary jazz containing and offering of mainstream, fusion, pop, gospel-styled and classical-tinged elements that make this first effort, one varied musical statement. This fourteen-piece light ensemble is comprised of the finest professionals and educators from the South Florida area—all alumni of the prestigious Frost School of Music from the University of Miami—performing in Miami and throughout Southern Florida since October of 2013. While boasting an A-list of players, the band is augmented by three special guest which include bassists Will Lee and Mark Egan as well as drummer Marko Marcinko—all UM attendees as well. Though Bonsanti provides the arrangements for the selection of the recording, the music opens up with a muscular version of the Clare Fischer arrangement ofBilly Strayhorn's classic "U.M.M.G." featuring splendid solo moments from Ed Maina on the alto, trombonist Dante Luciani and pianist Jim Gasior. Bonsanti—who also provided arrangements for the Jaco Pastorius Big Band—pays tribute to the spirit of the late renegade bassist by including a couple of tracks with which he is associated with particularly, Wayne Shorter's "Palladium," recalling the bassists contribution to the tune when playing with the jazz fusion group Weather Report and this rousing treatment of Pastorious' dedication to his children "John and Mary," featuring Gasior,Ed Calle on soprano and Matt Bonelli on bass. One of the stand out tunes on the disc is Joe Henderson's "Black Narcissus," with Calle on a sprite tenor saxophone, Jack Ciano on the drums and Gasior again on the keys and the entire band providing an exceptional rendition of the old classic. The contemporary sound continues with nice reads of Charlie Parker's "Donna Lee (In Disguise)," and Don Grolnick's "Pools" before the band ventures into different territory with a bluesy take of the pop classic "Hit The Road Jack" and a Gospel-styled romp of the Tommy Dorsey piece "Take My Hand Precious Lord" featuring spirited solos from trumpeter Ray Chicalo and baritone saxophonist Peter Brewer. Saxophonist Calle and guest artist bassist Will Lee, provide the solo moments on Bonsanti-arranged jazz version of Paul McCartney's hit song "With A Little Help from My Friends. "Chick Corea's beautiful waltz "Windows' and guitarist John Scofield's funky-flavored "You're Under Arrest" closes out the session leaving one wanting a tad more from this impressive ensemble. Nothing Hard is Ever Easy is not only a common phrase we are all familiar with, it just also happens to be a spectacular musical articulation of contemporary big band jazz with an exclamation point. Kudos to band leader Dan Bonsanti and his amazing cast of players for providing one heck of a performance and testament to their unquestioned steller musicianship. Track Listing: U.M.M.G. ; Palladium; John and Mary; Black Narcissus; Donna Lee (In Disguise); Pools; Hit The Road Jack; Take My Hand Precious Lord; With A Little Help From My Friends; Windows; You're Under Arrest. Personnel: Dan Bonsanti: conductor, synthesizer bass (5); Ed Maina: alto saxophone, flute; Ed Calle: tenor saxophone, soprano; Neal Bonsanti: tenor saxophone; Peter Brewer: baritone saxophone; Stephen Reid: trumpet; Cisco Dimas: trumpet; Ray Chicalo: trumpet; Dante Luciano: trombone; Major Bailey: trombone; Jim Gasior: piano, keyboards; Tom Lippincott: guitar; Matt Bonelli: bass; Jack Ciano: drums; Will Lee: bass (9); Mark Eagan: bass (10); Marko Marcinko: drums (5, 6, 11).